Proving his popularity in China, singer-actor Jung Yong-hwa swept a music chart and an online popularity ranking Tuesday. Jung’s agency said the CNBlue member topped the Gaon Weibo music chart and the Real-Time Hot Weibo Ranking. 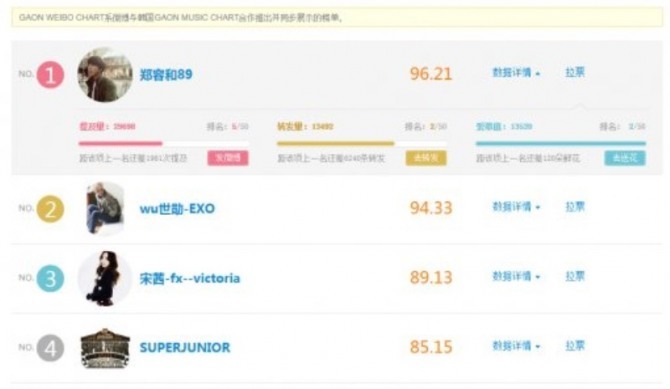 The Gaon Weibo chart is copublished by Korean music chart Gaon and Chinese microblogging service firm Weibo. The ranking is determined by combining the popularity of singers on the Gaon chart and the frequency of the references to the singers on Weibo. The agency added that the photo and comment Jung uploaded on his Weibo account also drew a great deal of attention from Chinese fans, topping the Real-Time Hot Weibo Ranking. Recently, Jung starred in the tvN drama “Three Musketeers.” The VOD publication rights to the show were sold in various Asian countries, including China. In the meantime, CNBlue plans to hold its live concert “2014 CNBLUE LIVE-Can’t Stop” in Nanjing, China, on Nov. 29.